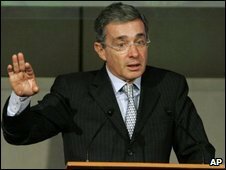 Colombia's Senate has overwhelmingly backed a referendum on allowing President Alvaro Uribe to stand for an unprecedented third term in 2010. A vote in favour would amend the constitution to allow the same right to any president. Opinion polls indicate that more than 80% of Colombians would currently approve the change. Opposition leaders say allowing the change would pave the way for the erosion of democracy in Colombia. In a recent BBC interview, Mr Uribe - who is considered to be one of Latin America's most popular leaders - declined to say whether he would consider standing for a third term. He has already changed the constitution once to allow for his re-election in 2006. The BBC's Jeremy McDermott in Bogota says Mr Uribe's policy of democratic security has pushed Marxist rebels away from the major cities and into mountain and jungle strongholds, illegal right-wing paramilitaries have been demobilised and several top drugs traffickers arrested. What is clear is that most Colombians are prepared to risk some disturbances to the checks and balances of democracy if they can be guaranteed that the war does not return to their doorsteps, he adds. The referendum needs to be approved by the country's Constitutional Court before it can be held.